Cat5e cables stand for Category 5 enhanced cables, and are the most commonly used cables in new installations due to their ability to deliver a solid network connection. Our host of Cat5e cables are not only a perfect fit for your installation; their superior design also means they greatly reduce the likelihood of crosstalk. When completing a project or installation, it is crucial to use a reliable and robust cable that will prevent signals on different circuits or channels from interfering with each other. Cat5e Ethernet cables are a step above Cat 5, meaning they can handle an impressive speed of 1000 Mbps (gigabit Ethernet) at 100 MHz. So if you’re looking for a high-performing, superior Ethernet cable that delivers unrivalled performance, a Cat5e network cable is the solution. No matter what the project or however big or small it may be, we have a range of impressive Bulk Cat5e Cables from brands including Excel, HellermannTyton, TE Connectivity and Ubiquiti, so you have plenty of choice for your project. We also boast our very own branded cable CE, guaranteed to deliver optimum performance. Each cable consists of 8 colour coded polyethylene insulated conductors. These are twisted together to form 4 pairs with varying lay lengths. These pairs, together with a strong nylon rip cord are jacketed in a heat resistant PVC material. Tested to 100 MHz, the guaranteed performance of this cable meets the ANSI/TIA 568C.2 and ISO/IEC 11801 requirements for PS-NEXT, attenuation, return loss, attenuation-to-crosstalk ratio (ACR)and impedance, making it ideal for high-end transmission links supporting today’s networking protocols.. Solid conductor 4 pair Cat5e U/UTP cable with PVC Grey outer sheath. Each cable consists of 8 colour coded polyethylene insulated conductors. These are twisted together to form 4 pairs with varying lay lengths. These pairs, together with a strong nylon rip cord are jacketed in a heat resistant PVC material. 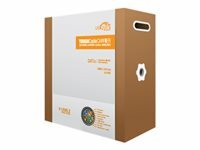 The printing detail on the sheath, includes the cables part number, specification details and a 305-0 reverse metre marking within each box supplied, allowing for quick and easy measurement of cable installed and the amount remaining within the box. Cat5e Cable - Solid conductor 4 pair U/UTP cable with low smoke zero halogen outer sheath. Each cable consists of 8 colour coded polyethylene insulated conductors. These are twisted together to form 4 pairs with varying lay lengths. These pairs, together with a strong nylon rip cord are jacketed in either Purple or Orange low smoke zero halogen material, which complies with the requirements of IEC332-1. The printing detail on the sheath, includes the cables part number, specification details and a 305-0 reverse metre marking within each box supplied, allowing for quick and easy measurement of cable installed and the amount remaining within the box. Solid conductor 4 pair F/UTP Cat5e cable with PVC Grey outer sheath. Each cable consists of 8 colour coded 24AWG polyethylene insulated conductors. These are twisted together to form 4 pairs with varying lay lengths. These pairs are wrapped in an aluminium foil tape screen with a solid drain wire and jacketed in a heat resistant PVC rated material. The printing detail on the sheath, includes the cables part number, specification details and sequential metre marking. Cat5e 4 pair F/UTP solid cable with 8 colour coded polyethylene insulated conductors. Each cable consists of 8 colour coded polyethylene insulated conductors. These pairs are wrapped in an aluminium foil tape screen with a solid drain wire, jacketed in a heat and UV, moisture resistant black polyethylene outer sheath, making this cable ideal for outdoor installation. 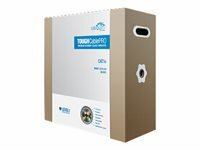 The printing detail on the sheath, includes the cables part number, specification details and a unique 305-0 metre marking within each box supplied, allowing for quick and easy measurement of cable installed and the amount remaining within the box. Solid conductor 4 pair F/UTP Cat5e cable with LSOH Purple outer sheath. Each cable consists of 8 colour coded 24AWG polyethylene insulated conductors. These are twisted together to form 4 pairs with varying lay lengths. These pairs are wrapped in an aluminium foil tape screen with a solid drain wire jacketed in a low smoke zero halogen material, which complies with the requirements of IEC332-1. The printing detail on the sheath, includes the cables part number, specification details and sequential metre marking.